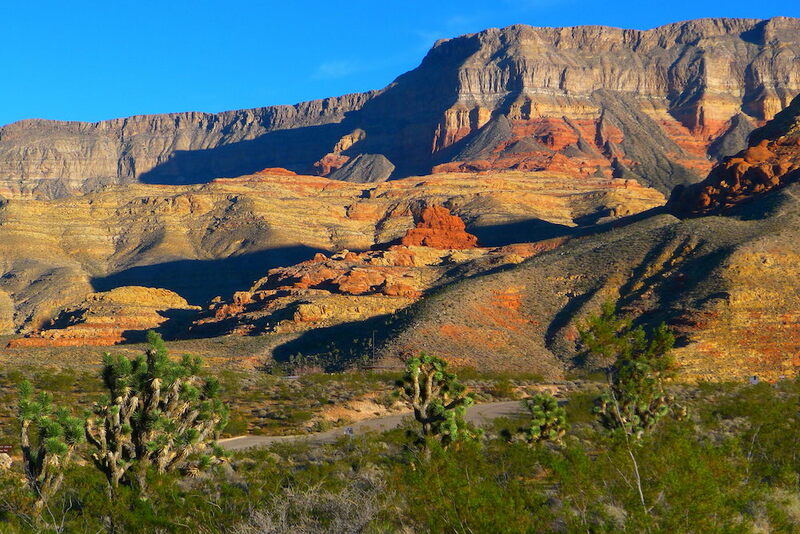 The Mojave’s Virgin Mountains can be seen from Arizona’s Virgin Gorge, which lies just outside of Mesquite, Nevada. Courtesy of Cindy Phillips. At first, there was no road at all, just a series of springs where the water table breached the earth’s crust. At the end of the last Ice Age (about 15,000 years ago), there had been many interconnected lakes, rivers, and springs here in the Mojave Desert. Since then, these extensive waterways have mostly dried up, leaving just two intermittent rivers (the Mojave and the Amargosa) and one permanent river (the Colorado). Yet the desert, where the average rainfall is less than four inches per year, still has over three hundred springs. Initially, these springs were connected to each other by the faintest of tracks, sewn together by animals who had come to rely on these sporadic waterholes for a nourishing drink, for respite from the searing heat, or to hunt other animals. For many years, the springs were known by the descriptions that Native Americans gave them: “cottonwood surround it,” and “red sandstone at its end.” Today, place names in the Mojave reflect concepts that were important to colonists of European origin: Badwater, Marl, and Soda. The human history of the Mojave Desert started with Native Americans living within the desert, eating from the land, and tailoring their lives to its shifting resources. It continued with European descendants living in spite of the desert, as they mined resources like gold, silver, lead, magnesium. More recently, modern people have rushed through on massive modern highways, divorced from the rhythms of the place. 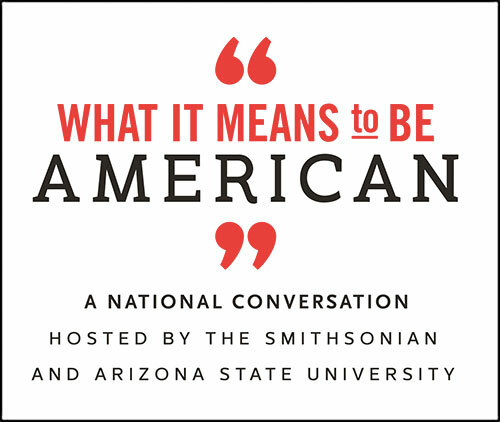 Now, some Americans are returning to live in the desert with a changed attitude toward its land—beginning a new story of hope, connection, and conservation. The indigenous peoples of the Mojave Desert adapted to the gradual drying of the landscape in various ways, but the springs and rivers were vital to their survival. Some early residents of the Mojave Desert stayed relatively stationary along the permanent Colorado River, like the Mojave Indians in the eastern part of the desert, or Cahuilla Indians in the southwest. Others were more mobile, like the Chemehuevi Indians. But for all, travel across the desert required an intimate knowledge of the landscape. Native peoples carefully mapped water sources, and occasionally included them in parts of song cycles, creating a verbal picture of the network of water locations to help guide their way. Various factors drove their movement, including seasonal food harvests in the mountains (pine nuts) or valleys (mesquite pods), communal hunting parties for bighorn sheep or rabbits, small-scale mining for salt and turquoise, and trade with coastal tribes. As residents followed game trails, traveled to familiar food sources, and traded, their routes, ever linked to ephemeral springs and rivers, became established tracks. Spanish explorers began using these Mojave trails in the 1760s. Friar Francisco Garcés, acting at the behest of the Viceroy of New Spain, traveled north from Mexico in 1776 along the Colorado River. Then, guided by Mojave Indians, he continued west across the Mojave Desert to the Spanish Missions at San Gabriel and up to Monterrey. He was searching for overland routes to supply and fortify the missions along the coast of California from Mexican outposts such as Santa Fe. Friar Garcés described the cordial reception he received from the Mojave Indians, who were known as Pipa Aha Macav, or “people who live along the water.” His account of his travels spoke of threaded trails of desert oases and springs, from the Colorado River to the Pacific Coast. Fifty years later, in 1826, Jedidiah Smith became the first explorer from the United States to travel overland across the Mojave Desert to California in search of waterways and furs. He followed the route of Garcés, by then known as the Mojave Trail, and also traveled along a more northerly route called the Spanish Trail that was originally used by the Utes and other Native Americans. This pattern of trail use, with and without the assistance and consent of the indigenous population, continued as settlers, miners, and colonists of European origin came to seek their fortune in California. This shift was not viewed favorably by those who were displaced. The Timbisha Shoshone Indians were unhappy when they learned that the pioneers misunderstood the land enough to name one region Death Valley. To those who had lived in the area for more than a millennium, the natural resources of the land offered everything necessary for their well-being. 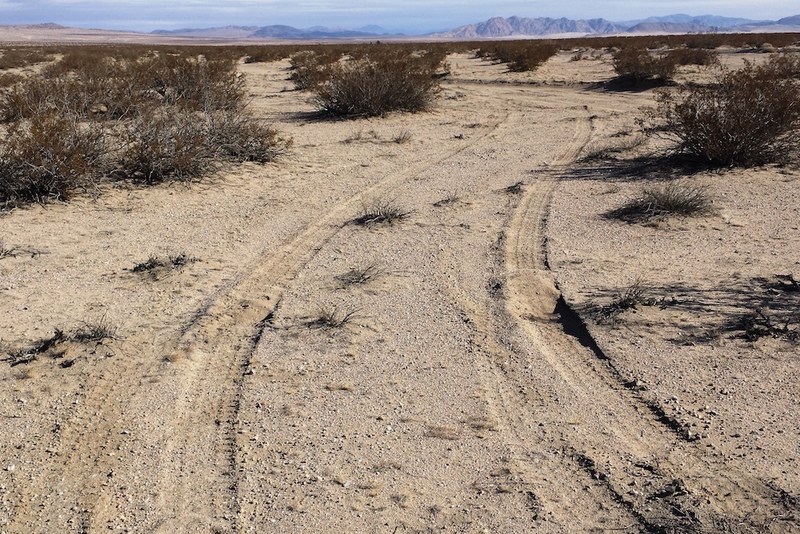 Originally, the Mojave Road was a trail used by Native Americans. Over time, it became formalized into a dirt road that wagons, coaches, and later cars used to cross what is now the Mojave Desert Preserve. Courtesy of Cindy Phillips. This quote suggests that by the mid-1840s the Spanish Trail was already under heavy use. It also attests to the way increased traffic impacted the environment. Those impacts were to increase significantly after 1848, when James Wilson Marshall discovered flakes of gold along the American River in California. The gold rush led to the establishment of mining towns, and all the businesses necessary to maintain residency—hardware shops, saloons, brothels, ranches—followed in quick succession. The population surged as men poured in, driven not only by a lust for gold and money, but also by the ever-developing ethos of manifest destiny and westward expansion. More people meant more incentive for the federal government and private businesses to provide roads, railroads, and technology. People and goods needed to move across some of the most forbidding territory in the United States. Early trains were steam-powered and required significant amounts of water to run, so they followed the existing travel routes—still connected to the springs—whenever possible. Where hills were steep, engineers built elaborate systems of pipelines to bring water to the trains. Eventually, groomed earthen roads and asphalt highways facilitated travel by early automobiles, which were followed by today’s modern cars racing through the landscape on interstate highways. These highways (and airports, and modern trains) helped sever human dependency on, and historical connection to, local water and food resources. Government engineers dammed the rivers, providing seemingly limitless power and water so that big cities in the region, like Los Angeles, Las Vegas, and Henderson, today resemble cities anywhere, able to ignore local limitations because they rely instead on a global network of resources. While native peoples of the Mojave Desert adapted to the rigors of the environment with only a few modifications, the explorers, settlers, and opportunists who followed adapted the desert environment to their lifestyle. Today, we drive holes hundreds of feet into the earth to tap underground water sources; farmers plant almond, pistachio, and orange trees where it once would have been unthinkable; and fountains, water parks, and artificial lakes are as common as in parts of the country with higher rainfall. But behind this solid assertion of stability lies a disquieting sense of impermanence. There are many places in the Mojave Desert where one sees the rusted carapaces of abandoned cars, shuttered towns, and boarded-up windows—all the weathered icons of land running dry. Lake Mead, which provides drinking water for Las Vegas, has a white “bathtub” ring that is left higher and higher above the lake’s surface with each passing year. And when the air conditioner breaks down, we get a flat tire, or we run out of gas, those of us who live here are reminded that the Mojave Desert is not an easy place for humans to live. From these glimmers of unease, a new vision is taking hold. People are again establishing permanent populations in Mojave Desert cities such as Las Vegas, Lancaster, St. George, and Barstow, supplanting the transience that once characterized the areas. A more diverse economy has replaced what was once seen as a way station or a place to get rich quick. This new permanence could bode well for the desert: We develop a greater interest in conserving what we must rely upon. A more connected relationship with the desert will not foreclose on alterations. Indigenous people before us lived in a stable world, but it was not a static one. They took fish from the river and salt from the caves. They managed groves of mesquite trees for their own use. They burned, cleared, and planted lands to supply themselves with the sustenance they needed. But they did so as permanent residents of the desert—as managers and as stewards, rather than as exploiters. As we continue to modify our environment, we will become permanent dwellers in the Mojave Desert with an eye to the long future, not as passers-through to another, richer place. Fred Landau and Lawrence Walker are emeritus plant ecologists at the University of Nevada, Las Vegas. They are the authors of A Natural History of the Mojave Desert.